The US is by far the largest economy in the World, with a nominal GDP of $17.4 trillion in 2014. However, it is not the World leader in all economic sectors: the US is a service-based economy, with a smaller focus on agriculture and industry than other countries (though its industrial and agricultural sectors are still the second- and third-largest in the World due to the sheer size of the US economy). 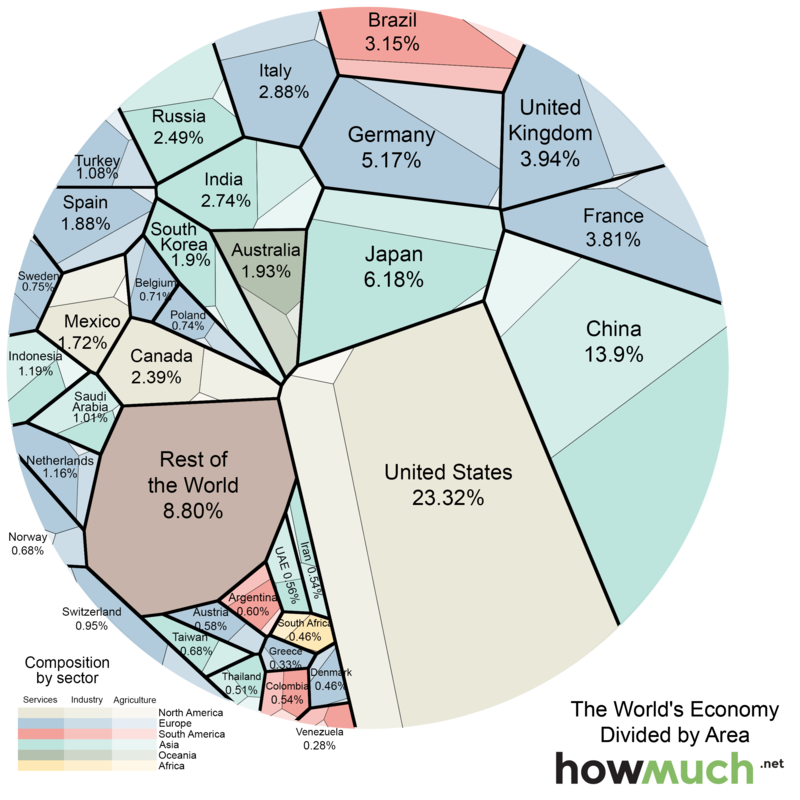 The graphic above (Voronoi diagram) represents the relative size of each country’s economy in terms of nominal GDP: the larger the area, the larger the size of the economy. The areas are further divided into three sectors: services, industrial, and agricultural. The US economy is mostly composed of companies engaged in providing services (79.7% compared to the global average of 63.6%), while agriculture and industry make up smaller-than-average of portions of the economy (1.12% and 19.1% compared to averages of 5.9% and 30.5%). An earlier version of this article wrongly showed in the legend of the diagram "Rest of the World" and was divided into: services, manufacturing and agriculture, now we are not showing this legend since "Rest of the World" is not divided into sectors.